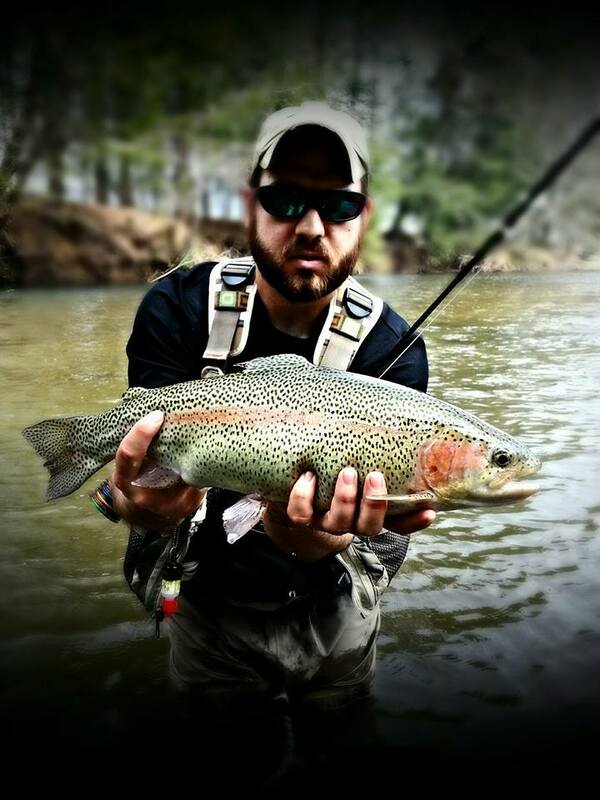 With Trout season either quickly approaching or already open,one thing you may soon be faced with is “combat fishing” or dealing with extremely crowded public areas where you will be fishing. The days of being able to get away from others and find true honey holes are disappearing. It’s not much fun to be fishing a good hole or run and have someone walk through the area you are fishing. You don’t want to be “that” guy. So, here are a few tips on proper fly fishing etiquette. First and foremost, remember everyone is there to have fun. Everyone wants to catch a fish and enjoy a day on the water. So, just be polite and don’t be afraid to strike up a conversation. All of the fly fisherman I know are very nice and willing to help. You might learn which fly is working (or which flies aren’t working). You may learn where the other angler is heading to fish so you know where to avoid for a while. You may strike up a conversation with someone who is new to fly fishing. You may be able to teach something new or give that extra support and knowledge that motivates them to stick with it. When you are out on the water, try not to walk through a run that someone else is fishing. Ideally, when you can, get out of the water and walk around. If you are walking behind another fisherman, give yourself some distance so you do not get in the way of their cast. (This has its own safety benefits for you as well.) If you see a fisherman working either up or down stream, try not to cut them off. Don’t just move up to the next run; go a few runs away so you are not in their way and they can continue working up or downstream. If you are fishing with a friend, keep your conversations and an appropriate volume. Some of us are happy to have a day on the water to collect our thoughts. The sound of a river can help transport me miles away from the stress of life. If I am fishing 100 yards from you and I can still hear you, you are too loud. Also, remember that trout are sensitive to loud noises; you do not want to spook the fish you are trying to catch. If you are in a float tube or boat drifting the river, please watch for those anglers that are wade fishing. One of the main tailwaters I fish is very slippery and moving quickly to get out of the way has resulted with me falling into the river. You have decent control if in a float tube or boat, so please be mindful and move. If there is room, try to go behind the angler to avoid spooking the fish he or she is casting for. We can’t talk about fly fishing etiquette and focus only on ourselves and not on the fish. Trout are very sensitive fish. Many of us grew up learning to fish for bass and panfish. How we handle trout is critical for their safety. 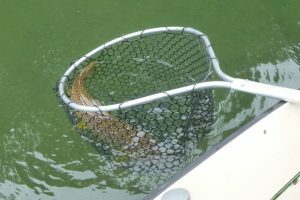 Rubber nets are better for the fish than old-fashioned string nets because it the rubber helps protect the slimy, defensive mucus that is found on trout. This mucus layer protects the trout from bacteria and disease. Removing this layer makes the trout more susceptible to dying. Barbless hooks are also easier on a fish than barbed hooks. It is very easy to unhook a fish with a barbless hook, which requires less handling of the fish and places less stress on the fish during the release. Despite good fishing practices, there may be occasions where you gill hook a trout. If it is not bleeding, it is easier on the trout to just cut the line to release and let the hook fall out by itself. In handling trout, you always need to be conscientious not to squeeze the fish too hard. This could happen in trying to get the hook out or when you’re trying the hold that squirmy, slimy fish for a picture. If squeezed too hard, you can injure the trout’s internal organs causing death after its release. If you are going to take a picture of a trout, do not hold the trout by the lip. This can break its jaw and injure the gills, which will ultimately kill the fish. A recent study of largemouth bass, where biologists are electroshocking the water, is finding larger bass with broken jaws from being “lipped”. The final handling tip I offer is do not hold a large trout up vertically. A trout’s organs are loose and can be injured by holding the fish upright. Trout are very sensitive fish. However, with safe and conscientious handling, we can; ensure fishing for future generations. And while anglers aren’t typically as sensitive as the fish, show some courtesy while on the water so that everyone can enjoy their time on the water. Soaring Eagle Outfitters wishes everyone Tight Lines and Safe Wading with the upcomping season.